You couldn’t have written this. A beautiful sunny Sunday in Huddersfield. Arsene Wenger’s final ever match as manager of Arsenal. Town are ALREADY safe from relegation. And more shockingly, Town fans can relax. After a more than wonderful first season in the Premier League, this was a day of celebration. There was a special t-shirt on every seat, making the crowd a more co-ordinated sea of blue and white – with a corner of red. 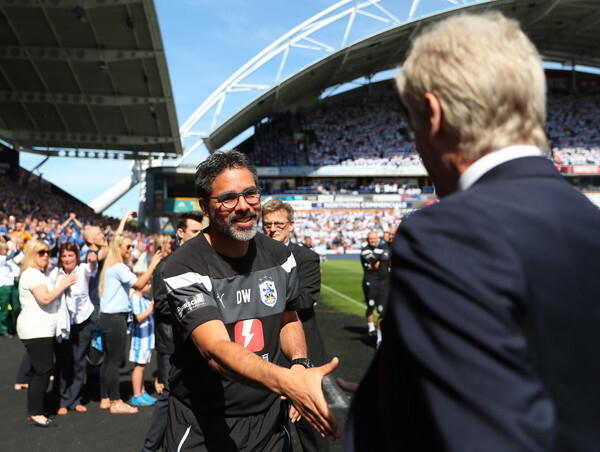 David Wagner had paid enormous tribute to the great Arsene Wenger in his pre-match comments, and the players formed a guard of honour for the Frenchman, bowing out after 22 long years. Wagner also presented Wenger with a half and half shirt. Fittingly, it is Town that got to share Wenger’s big day, as both clubs share a common legend – Herbert Chapman. But as much as it was Wenger’s day, it was our day as well. Against all the odds, against all the pundits, against the majority of football, Huddersfield Town are staying in the Premier League. And if there was a game to show that we belong here, on the biggest of stages, it was this one. Town could’ve possibly been forgiven for ‘having their flip-flops on’, or ‘being on the beach’, particularly given that Wagner allowed the players 48 hours off following the Chelsea game in midweek. But the team selection, and performance that followed was quite the opposite. Wagner selected a very strong, attacking eleven, despite sticking with the formation that brought a point a piece at the Etihad and Stamford Bridge. Town really came out of the blocks, with Mounie heading an early cross straight at Ospina, before the returning Ince squandered a huge chance. He was found by Pritchard but blazed over from close range. Town continued to press for the opening goal, but couldn’t quite find it. The visitors showed very little in the way of attacks until the 38th minute, when a well-worked move found Ramsey, who squared it for Aubameyang who poked home. Town pressed further after the break for an equaliser, with Ince forcing a top-class save from Ospina. At the other end, as Town pushed bodies forward, Arsenal broke twice, but Lossl denied Lacazette and Welbeck a second gunners goal. In the dying moments, with Town in search of one final celebration, Mooy fired against the bar on the turn, before a goalmouth scramble couldn’t be converted. It wasn’t to be for Town, but that didn’t spoil the day for Town who were in party mood all day. In fact, it is probably the loudest I’ve consistently heard the John Smiths over the course of a full match. The traditional half-hearted pitch invasion followed, before the players and staff were allowed their well-earned lap of honour. It was led by Dean Whitehead, a fantastic servant for Huddersfield Town and football in general, as he bowed out from the playing side for the final time. At 36-years old, and with 621 appearances under his belt (62 for Town), he will spend the next months alongside Wagner, before taking up a role as under 17’s manager from January. This season has been a joy to behold, and we’ll be back again to do it all again from August. But the work certainly doesn’t stop here for Huddersfield Town. Firstly, we’ve got to get our miracle-working manager signed up to a long contract, and we’ve definitely got to be shrewd in the transfer market if we’re to compete again next term. Then its a case of preparing the team in the best manner possible to make sure these good times at Huddersfield Town are here to stay. Previous A night we’ll never forget – Town survive at the Bridge!